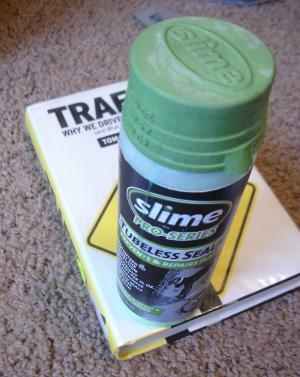 I picked up a bottle of Slime Pro Tubeless Sealant at Interbike last year while it was still in testing. They called it the Pro-series and endurance racer Jay Petervary was one of the first pro users. The folks at the slime booth were awesome for giving me a bottle to test out in the rugged cactus spine infested Arizona desert. Slime Pro just hit the market this spring. I’ve got two stories to tell about the Pro Sealant. Two tires, two different stories. Installation was a snap. Quick, clean and easy. After six months I’m still riding strong with no front flats. I cracked the bead last week and added another 3 oz. I did have one instance where I picked something up and it took just a few seconds to seal, the green slime oozing out (see pic below), but it did seal and I rode on without adding air. 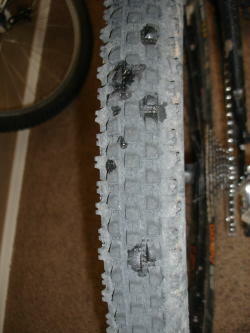 The tire maintains good air pressure from ride to ride, though I do add just a little pressure every couple of weeks. On a new tire installation I’m fully satisfied. Rivals Stan’s and Super Juice for performance. The rear tire was a little more problematic. The bead took a bit longer to seal and I lost about a half ounce of the green stuff in the process. Good thing I started with three ounces. Out on the trail I ran into one burp issue and one “took way too long to seal” issue. The burp was the result of extra low pressure set for a technical climb. The sealing issue knocked me out of the second spot in a sweet climb on Goat Camp. I wasn’t happy about that. I had to stop and add pressure holding the tire just right so slime could fill it. In addition to those two instances, I have a cosmetic beef with the sealant. The slime never completely sealed all the previous spine punctures. 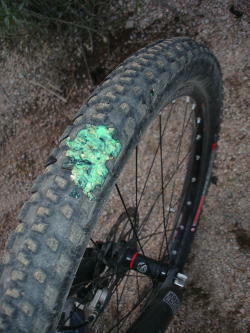 Just the smallest bit of slime oozed out giving my tire slime spots. No measurable amount of pressure was ever lost, but it just looked really bad. Even my wife commented, “That’s not going to get on the carpet is it?” I’m at a loss to know why it leaked out the old punctures. Despite the issues I always finished my ride with air. Slime Pro does its job. No flats six months and rolling. Only a couple of sealing issues in six months is fantastic. It works better on the Captain than on my previously Stanned Larsen TT. I like it… but…I prefer the confidence I have when using Stan’s. And ultimately, I stick with the products that I have full confidence in. If you are a fan of Slime, you’ll love Slime Pro . If Stan’s has already won you over, it’s my opinion that Slime Pro doesn’t offer anything above and beyond what Stan’s delivers (except the different smell) and it’s more expensive – Slime Pro is advertised at 19 dollars for 16 ounces. Stan’s is advertised at 22 dollars for 32 ounces. Slime tubes. I’ve got nothing but great things to say about Slime Smart Tubes. I’m running one Smart Tube shrader valve and one self-slimed presta tube on my converted singlespeed. Both have held air for over a year each. I carry a spare presta Smart Tube in my CamelBak on every ride. Thank you Slime for keeping me rolling. I built up a set of I9’s with Stans Arch’s, Stans tape, Stans valves, and Specialized Sauserwind 2.0’s. I did this right….valves siliconed…everything perfect. I heard good things about the slime so I gave it a try. The bead sealed up fine but the tire just wouldn’t hold air. I’d lose 20lbs of pressure overnight. I gave it a week, I kept pumping and riding the wheels. No good! Finally I broke out the water bottle and sprayed the beads. No leaks on the bead but the air was still bubbling through the rubber in the sidewalls. The slime is too wet and does not seal sidewalls. The air was still going right through the rubber even after a week of riding. I broke it down and put in Stans. The sidewalls sealed almost immediately, I lost 2 lbs of air in first 3 days. Bottom line, Slime Pro seals beads but won’t seal sidewalls. Save your money and go with Stans. Stans dries up for a reason….it won’t work if it doesn’t. Stans is great, but I’m concerned with the issue that it has amonia and can damage yor rims and tire. I just got some Crossmaxs, and was thinking on using Slime or Flat Attack on Larsens, Nevegal or Python. Any thoughts? Yep, that’s about the mileage I got as well. It certainly aint bad for a tire. Cheers. I ran my first Larsen TT 800 miles before the de-lamination weakened the sidewall and it blew out. My second TT lasted 800 as well but a torn off a knob was its demise. So yes, it looks like the de-lamination is common. But 800 miles isn’t too shabby for a rear tire. 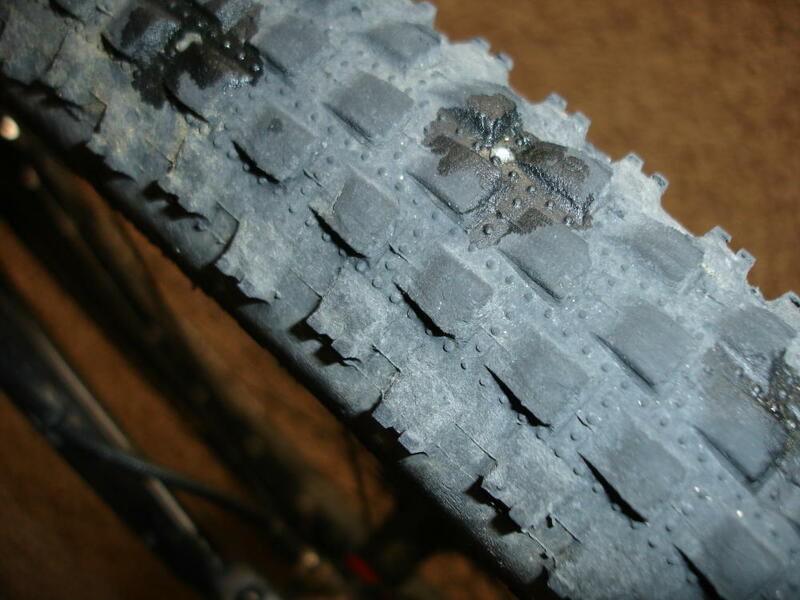 I’ve been using Stan’s for years with total confidence, but I noticed that anytime I use it with Maxxis tires, it causes weird bubbling (de-lamination) between the tread and the threaded layer beneath. You mentioned that you run a Larsen TT and this has happened on 2 of them. I spoke to Peter at Rage and he mentioned that this in not uncommon. Ever happened to you?